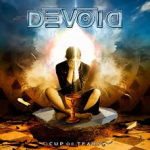 Share the post "Album review: DEVOID – Cup Of Tears"
Devoid is the brainchild of French guitarist Shad Mae and features vocalist Carsten ‘Lizard’ Schulz (Evidence One and many other guest vocal spots), keyboardist Jorris Guilbaud, bassist Ben Toquet and drummer Ben Wanders. Joining this core of musicians are guest guitarists Mattias Ia Eklundh (Freak Kitchen), Daniel Palmqvist (Beyond The Katakomb), Magnus Karlsson (Primal Fear) and Henrik Danhage (Evergrey). Carsten ‘Lizard’ Schulz is a perfect fit for the songs on here with his powerful and melodic delivery, which coupled with the backing vocals and keyboard solos brings to mind classic Royal Hunt, none more so than on the excellent ‘Colours Fade To Grey’. The keyboards are all over this album, a perfect foil for the guitar crunch and solos provided by Shad Mae and his various guests. The guitar widdle is set to ‘max’ on ‘Hollow Point’ – the added choral effects and drums make this one a real stand out. For more straight ahead melodic metal with an instant chorus ’Soldiers’ and ‘Collective Heart’ do the trick (loving the keys on the latter song). This entry was posted in ALBUM REVIEWS, ALBUM REVIEWS (Mobile), All Posts, PURE METAL (All posts), Pure Metal/Album reviews and tagged album, Carsten ‘Lizard’ Schulz, Cup Of Tears, Devoid, Evergrey, Freak Kitchen, Kamelot, melodic, metal, Progresive, review, Shae Mae. Bookmark the permalink.